It is so hard to believe it has been 17 years since the Twin Towers fell in New York City. I can still picture that day like it was yesterday. I remember the feeling of walking into 8th grade not really understanding what happened or the gravity of it all. I grew up in California and had never been to New York, so at the time it all seemed so far away. We watched the news the entire day at school, even as the second plane hit the remaining tower. That moment will forever be burned into my memory. How could this happen? Who would do such a thing? My tiny 12-year-old self just couldn’t come to terms with the lives lost, and families changed forever. In fact, my 30-year-old self still struggles with this. But, you know what I also remember? The goodness that came after. I remember the pride, and kindness people extended to complete strangers. Everyone had a new perspective – a new appreciation for life, liberty, and the pursuit of happiness. Do you remember where you were that day? How you felt? 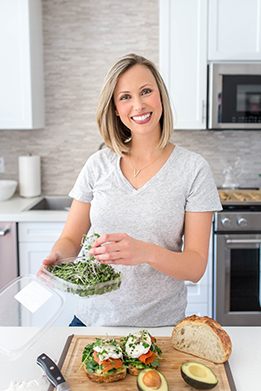 I thought in honor of September 11th, and this great country we get to call home, I would celebrate with a little Red, White, and Blue recipe. Not only is it a salute to the colors we get to stand for, it is a celebration of Summer bounty and goodness. 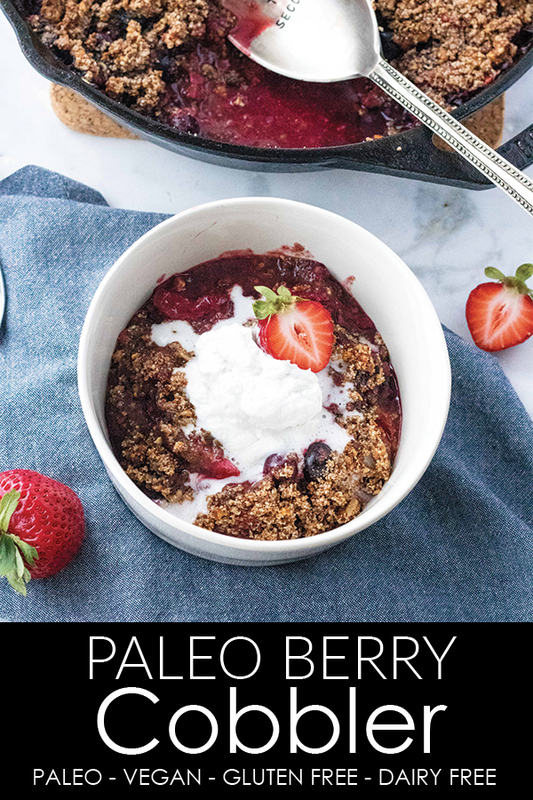 This paleo berry cobbler is perfectly sweet, and oh so decadent when topped with coconut whipped cream. I used strawberries, raspberries, and blueberries for the filling, but feel free to use whatever berry blend you prefer. The berries are lightly coated with lemon juice, agave or maple syrup, and arrowroot powder before being layered into your baking dish. The topping is a perfect crunchy addition thanks to my favorite paleo granola . I find it in bags at Costco, but Amazon sells it too. This stuff is incredible! I love it with yogurt, a little almond milk, or straight out of the bag by the handful. It is grain-free, and has chunks of almonds, pecans, and coconut flakes. 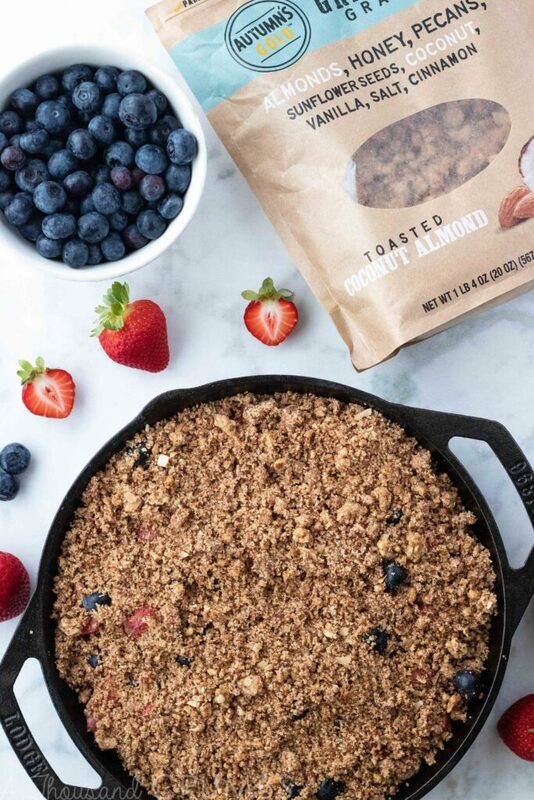 It blends perfectly with a little almond flour and coconut sugar for the ultimate paleo crumble topping. 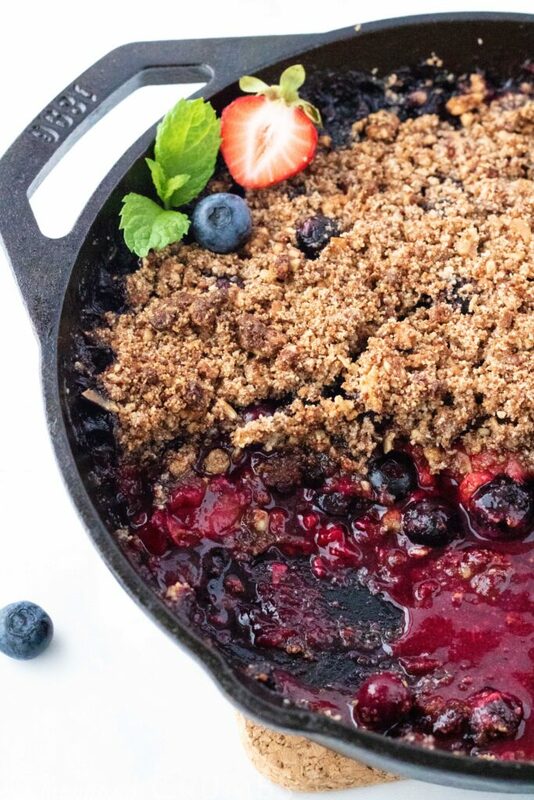 Now, what would a warm berry cobbler be without a little whipped cream!? 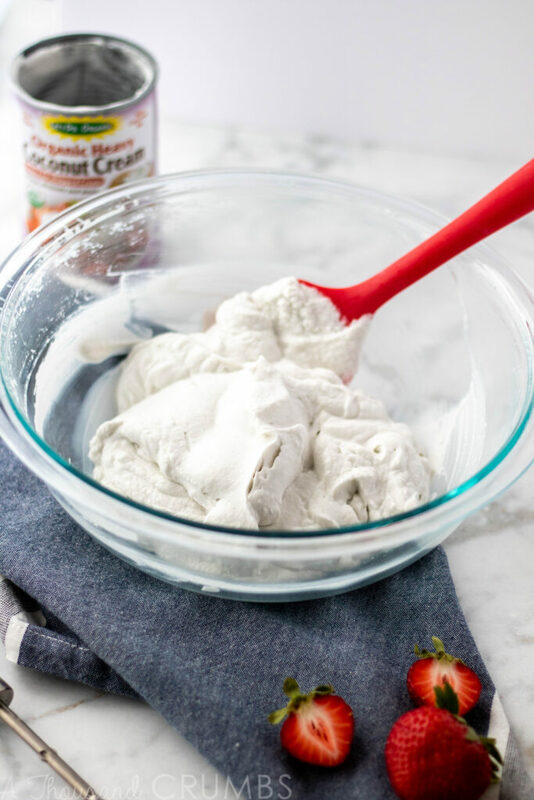 But because we’re keeping this paleo, I decided to whip up some coconut whipped cream, which is way easier than you might think! There are two tricks to thick and creamy coconut whipped cream – the first is making sure you buy the full-fat kind. I even used heavy coconut cream. The second trick is making sure you refrigerate the can overnight before whipping. I even refrigerated my beaters from my hand mixer. This ensures nice stiff peaks. And there you have it! 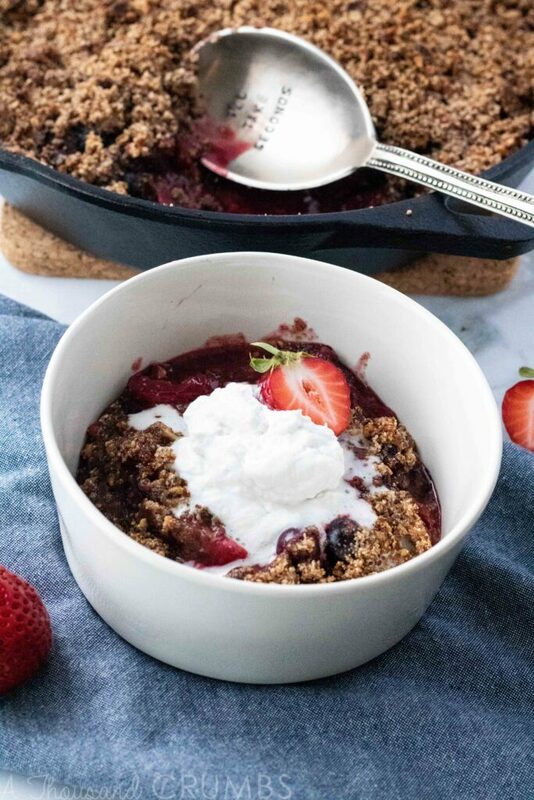 A not-to-sweet paleo berry cobbler with coconut whipped cream. Isn’t this just the prettiest patriotic dessert ever? Now go hug your parents, kids, siblings, friends, significant other, pets, and tell them you love them. Every day of this life is a gift. Pre-heat your oven to 350 degrees. Get your baking dish ready. I like using my 12-inch cast iron skillet, but a rectangular baking dish works well, too. In a large bowl, add the berries, lemon juice, arrowroot powder, and agave. Toss to combine, and create an even layer in your baking dish. In the bowl of your food processor, add the granola, almond flour, coconut sugar, and salt. Pulse a few times to break up the granola. Finally add the coconut oil, and pulse again to combine. 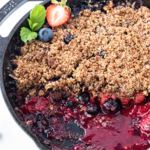 Spread the topping evenly over the berries and bake uncovered for 40-45 minutes or until the fruit is bubbling and the top is golden brown. To make the coconut whipped cream, open the cold can of coconut cream and scoop out the cream that has solidified on top. Stop as soon as you reach the water. The water can be saved and used for other recipes, or you can drink it as you’re whipping. Add the cream to your stand mixer, or to a bowl for use with your hand mixer. Beat the coconut cream on HIGH for 4-5 minutes, or until soft and fluffy peaks form. Mix in the agave and vanilla. Let the cobbler cool for 10 minutes before serving.